To use this tool, you need to know a free flag (if your hack is fresh and FR, 1FF is free). Type your free flag into the Flag field and click apply. 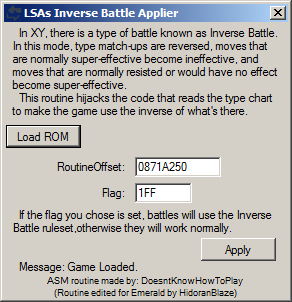 To make a battle Inverse, set the flag, to make battles normal again, unset the flag… simple as that. You can type in an offset you wish for the routine to be places, but the tool automatically finds free space so you don’t need to bother with that unless you have a specific plan.